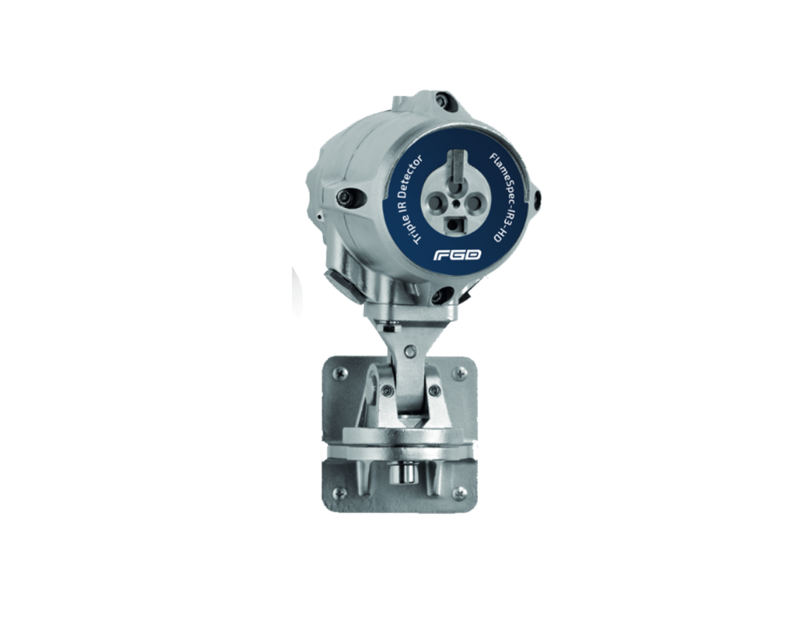 The F&G FlameSpec HD Video Flame detector series are top of the line ATEX and FM approved UV/IR, IR3 and Multi IR Hydrogen flame detectors and have the fastest and most reliable detection of fuel, gas ignition outburst of fire or vapor explosion and the highest immunity to false alarms on the market. 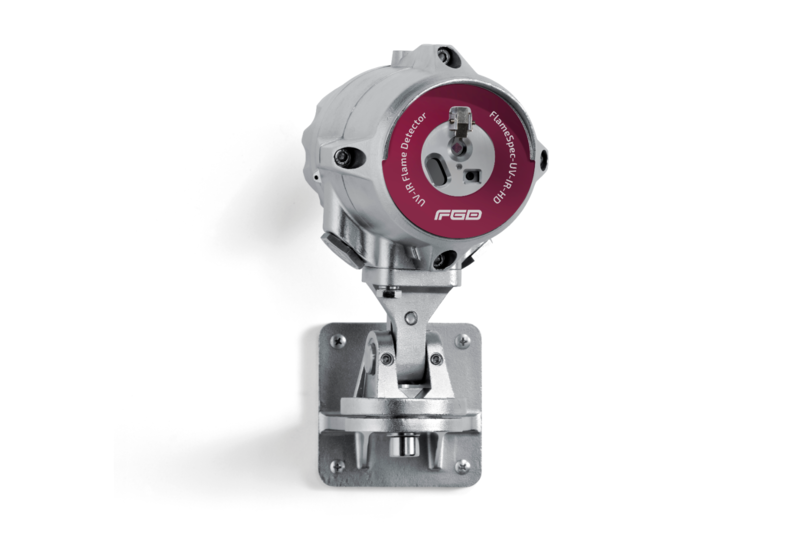 All our flame detectors are self-contained stand-alone devices designed for direct connection to control and alarm systems or automatic fire extinguishing systems using relay outputs, 4-20mA, HART or RS485 outputs. FlameSpec-IR3–HD is the next generation of the IR3. It is being introduced to further enhance the protection and safety for these high risk and high value industries. 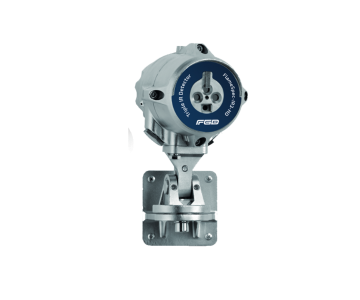 The FlameSpec-IR3-HD will detect fires and explosions extremely fast, thus allowing preventative action to be initiated even more rapidly and minimizing the consequences! 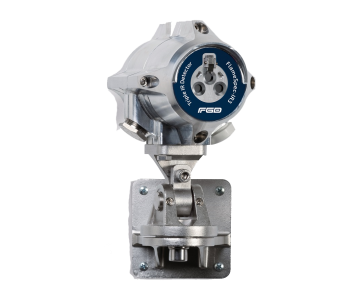 Integral HD quality video, with event recording, on top of the proven, superior capabilities of Triple IR (IR3) flame detection, provides a very powerful safety tool to protect personnel, plants, and processes. 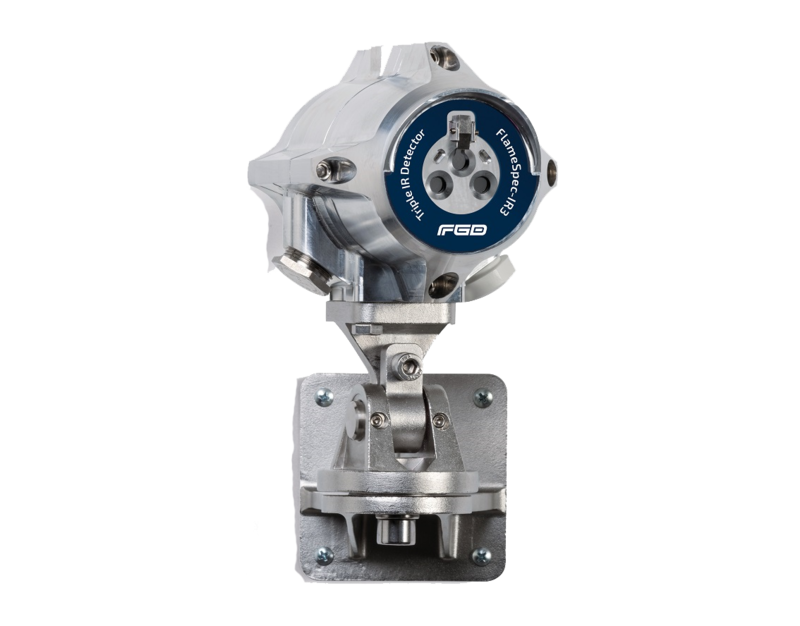 The FlameSpec-IR3-HD flame detector provides ultra-fast response, high performance, and reliable detection of all types of hydrocarbon fires (visible and non-visible). 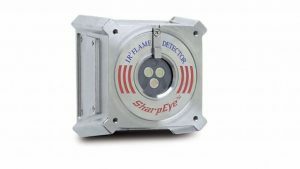 The detector addresses slow-growing fires as well as fast eruption of fire using improved triple IR (IR3) technology. 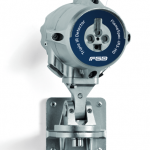 It operates in all weather and light conditions with the highest immunity to false alarms. 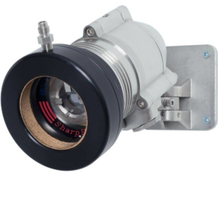 In addition, the detector provides high-definition (HD) video output of the monitored area with clear imaging of a fire event and of personnel at distances up to 100 ft (30m). This allows the rescue team to be aware of the exact situation before entering the hazardous area. The detector automatically records video of any fire event (1 minute pre- and up to 3 minutes post alarm initiation). These features, along with the built-in event logger, provide additional means to study the cause and development of fire events for “lessons learned” reviews. 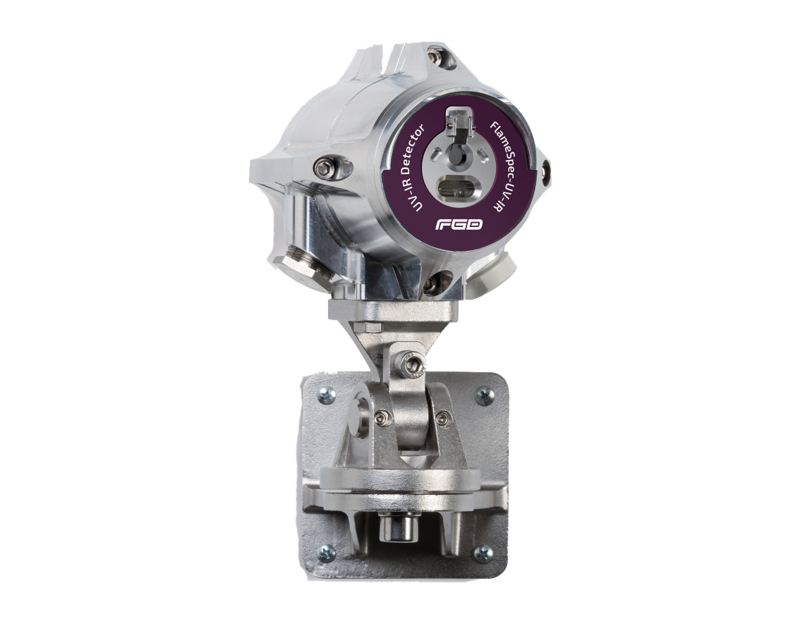 The FlameSpec-UV-IR-HD flame detector provides ultra-fast response, high performance and reliable detection of a large variety of fires including hydrocarbon fires (visible and nonvisible), as well as Hydrogen fires. technology. The detector operates in all weather and light conditions. In addition, the detector provides high-definition (HD) video output of the monitored area with clear imaging of a fire event and of personnel at distances up to 100 ft (30m).This allows the rescue team to be aware of the exact situation before entering the hazardous area. The detector automatically records video of any fire event (1 minute pre- and up to 3 minutes post alarm initiation). These features, along with the built-in event logger, provide additional means to study the cause and development of fire events for “lessons learned” reviews. Hydrogen and Hydrocarbons flame detection. Data/Event logger - alarms, faults and other relevant events are logged to non-volatile memory. Ethernet communication – in addition to the standard methods, such as 4-20mA and Modbus. Built-in-Test (BIT) - Automatic and manual internal self-test of window cleanliness and the overall operation of the detector (for both IR and UV channels). Window heater to avoid condensation and icing. 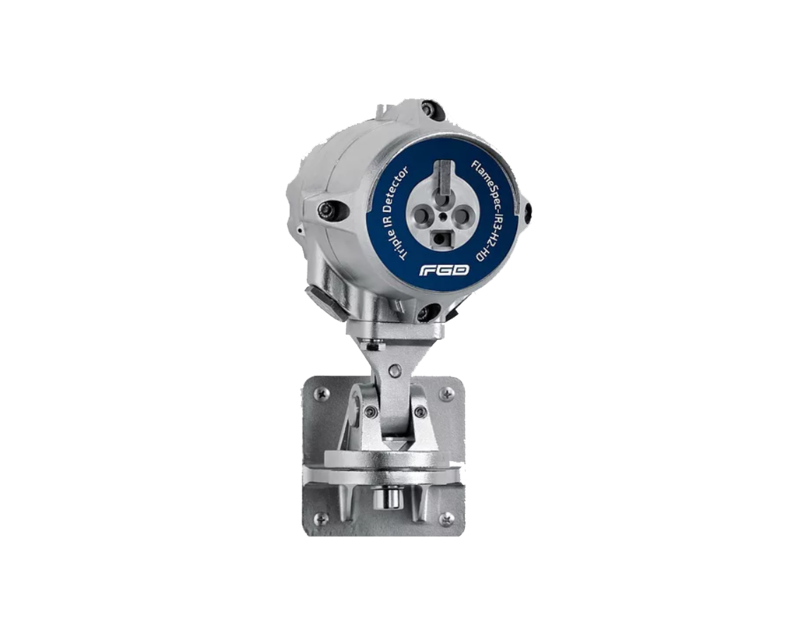 Tilt mounting bracket can be connected either above or below the detector. Configurable detection mode – allows configuration of UV-IR, UV or IR detection modes. 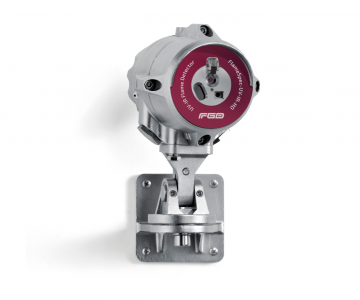 The FlameSpec-UV-IR flame detector provides ultra-fast response, high performance and reliable detection of a large variety of fires including hydrocarbon fires (visible and nonvisible), as well as Hydrogen fires. Configurable detection mode – allows configuration of UV-IR, UV or IR detection mode. The FlameSpec-IR3 flame detector provides ultra-fast response, high performance and reliable detection of all types of hydrocarbon fires (visible and non-visible). The detector addresses slow growing fires as well as fast eruption of fire using improved triple IR (IR3) technology. It operates in all weather and light conditions with highest immunity to false alarms. Standard fire in only 1.3 second from 50 ft. (15m) and 3.7 seconds from 230 ft. (70m). 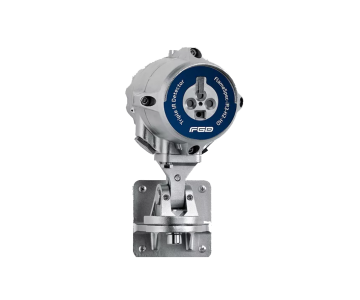 Add to that, the integral event recording, on top of the proven superior capabilities of Triple IR (IR3) flame detection and you have a very powerful safety tool to protect your personnel, plant and process. Extreme sensitivity - up to 260ft (80m) for a 1ft² (0.1m²) n-heptane pan fire. 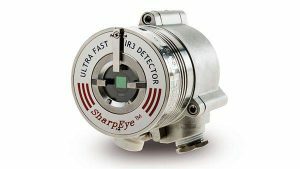 Ultra-fast detection mode - detection within 40 milliseconds for fireballs or explosions. 1.3 second detection time - for 1ft² (0.1m²) n-heptane pan fire at up to 50 ft. (15m) distance. Built-in-Test (BIT) - Automatic and manual self-test of window cleanliness and the overall operation of the detector. © 2018 All rights reserved by Desu Systems B.V.
An email or phone call from one of our representatives. The right information from our experts. Desu Systems BV – privacy statement: what we do with the personal details of our visitors, customers, applicants and other relations. The General Data Protection Regulation (AVG) will apply as of 25 May 2018. In order to carry out our activities properly, it is sometimes necessary to process your personal data. Personal data are data that provide information about an individual person, such as contact details, but also financial data or data about other privacy-sensitive matters. Of course, we have taken measures to comply with the new legislation. We would like to inform you about this. • We will always tell you what we do with your details and how, for example, you can exercise your right of access and objection. • We only use the information for the purpose for which we have collected it (such as the execution of an agreement, customer relationship management, customer administration and marketing). • We do not collect, use and store more data than we need, to achieve the purpose for which we obtained the data and only if there is no other way to achieve the same goal. • The more privacy-sensitive the information, the less we use the data. • We only use the data to the extent that there is a reason mentioned in the law. • We have taken appropriate security measures against loss of or unauthorized access to personal data. • We do not provide your personal data to third parties. • In this privacy statement you will find information about what we do with the personal data we receive when we carry out our activities. • What type of personal data do we process? • For what purpose do we process your personal data? • Why may we use your personal data? • Who has access to your personal data? • How long do we keep your personal data? • Who is responsible for the processing of your personal data? • Who can I contact if I have questions about the use of my personal data? • What about the use of my personal data by third parties? • How do we secure your personal data? • What rights do you have with regard to the use of your personal data (and how can you exercise them)? • Do you place cookies when I visit your website? • Do you use my data for sending newsletters? Desu Systems BV is responsible for the processing of your data. Which type of personal data do we process? • Contact details (such as name, e-mail address, work address, telephone number, a message left by you, including any personal data you have left behind in that message). • Cookies (see below). • The name of the organization for which you work or that you represent, your job title or job title. • Data used to calculating or recording invoices, making payments and collecting receivables, including invoice and delivery addresses, when you purchase services or products from us. • Information related to the type of browser, OS or type of device that you use to visit our website. • Security camera images when you visit our offices. • Any other information that you may provide to us. General visitor data is kept on our website, such as the most requested pages. The purpose of this is to optimize the layout of the website for you. The data can also be used to offer more specific information. No personal data will ever be sent / recorded by you via the internet. Desu Systems BV uses Google Analytics on the website, a web analysis service offered by Google Inc. (“Google”). Google Analytics uses “analytical cookies” (text files placed on your computer) to help analyze the use of the website. With this information, Desu Systems BV can improve the quality and effectiveness of its website. For the use of these analytical cookies it is not required to first obtain permission from website visitors, provided that Desu Systems BV complies with the 4 steps as included in the manual privacy-friendly setting of Google Analytics of the Dutch Data Protection Authority. • Desu Systems BV has entered into a processor agreement with Google; • Desu Systems BV has privacy-friendly Google Analytics, which means that the information is anonymised as much as possible. The IP address consists of 4 so-called octets of 3 digits each. Desu Systems BV has chosen to mask the last octet of the IP address; • Desu Systems BV has deactivated the option “share data with Google” in the default settings of Google Analytics. This means that the collected information is not shared with Google or others. Desu Systems BV has also not allowed Google to use the obtained information for other Google services; • Desu Systems BV informs visitors on its website about the use of Google Analytics. Finally, we inform you that Desu Systems BV does not use other Google services in combination with the Google Analytics cookies in addition to the use of AdWords. Desu Systems BV does not place tracking cookies on its website itself, but if you use social media cookies, third parties can place them. How do we use that information and on what basis do we do that? • For service purposes: to be able to follow up your message and to inform you about the next steps. • For relationship management, marketing, customer administration and service purposes (to inform you of the latest news about Desu Systems BV and relevant services, marketing and measuring response to our marketing campaigns, managing our CRM and improving the functioning of our website) . • To develop sales-promoting activities. • To be able to conduct adequate customer administration and debtor management. • For internal control and company security. • The use of your personal data is necessary for: • The execution of agreements with our customers. • Compliance with our legal obligations. • Promoting our legitimate interest to be able to (continue to) provide our services to our customers as efficiently as possible. • Promoting our legitimate interest to be able to provide our services as efficiently as possible to the visitors of our website and to use our website as well as possible and our relationships. • Looking after your legitimate interest in obtaining the right information. • The legitimate interest of Desu Systems BV to secure our properties. Desu Systems BV uses contact details of other relations than its customers for sending commercial information, such as newsletters and invitations to events only if you have given permission in advance. You can always withdraw your consent by using the unsubscribe option included in each message or by sending an e-mail to info@desusystems.com . We will ask you for permission to use your contact details again after three years. Desu Systems BV will not provide your personal data to third parties, unless Desu Systems BV is obliged to do so on the basis of a statutory provision or a court decision. We also do not use your information to keep track of which ads are of interest to you or to allow ads to match your interests. It may also happen that third parties, such as our accountant and our legal and financial advisors, gain access to your personal data within the framework of assignments and / or supervisory tasks that Desu Systems BV performs in respect of Desu Systems BV. • If you have subscribed to a newsletter or have given permission to receive personalized messages, we will retain this permission for 2 years. Even if you decide at a certain moment that you no longer wish to receive the newsletter or personalized messages, we will retain the withdrawal of your request. • If you are a client of ours, we will retain your data during the agreement that you have entered into with us and then for another 3 years. • If you are a potential customer and you have expressly agreed that we will contact you, we will retain your data until you opt out or after 2 years from the time you last contacted us. • We always remove inactive client accounts after 7 years. • Tax regulations require us to keep our administration with your invoice, payment and order data for 7 years • We do not store camera images for more than 6 months. Unless we see something suspicious that we have to further investigate whether the images should be kept longer because of another legal obligation. In all cases, Desu Systems BV may, for specific reasons, retain your data longer than indicated above if this is required by a statutory regulation or if longer storage is really necessary for carrying out our activities, for example to handle complaints, disputes to resolve or prevent fraud and abuse. We have taken all reasonable, appropriate security measures to protect our visitors, customers and relations against unauthorized access or modification, disclosure or destruction of personal data. We comply with the applicable security standards. If despite the security measures there is a security incident that is likely to have adverse consequences for your privacy, we will inform you as soon as possible about the incident. We will also inform you about the measures that we have taken to limit the consequences and prevent repetition in the future. • You may object to the use of your personal data, for example if you believe that the use of your personal data is not necessary for the performance of our activities or the fulfillment of a legal obligation. • You are entitled to inspect your personal data. This means that you can request which personal data is registered and for which purposes that data is used. • If you feel that we have incorrect personal data about you, you can have these personal details corrected. You can also ask us to limit the processing of your personal data, also for the period we need to assess your requests or objections. • You can also ask us to remove your personal data from our systems. • You can also ask us to ensure that your personal data is transferred to another party. • We will comply with your request, unless we have a compelling, legitimate interest not to delete the data, which outweighs your privacy interest. If we have deleted the data, for technical reasons we can not immediately remove all copies of the data from our systems and back-up systems. We may refuse to comply with the aforementioned requests if they are made unreasonably often, demand unreasonably heavy technical efforts or have unreasonably severe technical consequences for our systems or endanger the privacy of others. You can submit the aforementioned requests or make the aforementioned objection by sending a letter with your name, address, telephone number and a copy of a valid proof of identity to the privacy coordinator of Desu Systems BV. This can be reached via privacy@desusystems.com Remember to make your BSN number on the copy of the ID unreadable before you send it. Where can you get more information about how Desu Systems BV handles your personal data? 1.1. In these General Terms and Conditions, the terms below will be defined as follows, unless expressly stated otherwise. 1.2. DESU: a legal entity that applies these General Terms and Conditions, and one or more legal entities, irrespective of whether they are established in the Netherlands, that are affiliated and/or connected with DESU. Buyer / Client: every natural person or legal entity that has a contractual relationship with DESU based on an agreement concluded with DESU, or that wishes to enter into an agreement with DESU. The terms Buyer/Client/Customer will particularly refer to any party that purchases goods from DESU and takes delivery of same, as well as to any party on whose instructions and for whose account work is performed and services are provided. 1.3. The Work: all forms of services, relating and/or pertaining to the goods sold or to be sold and to be delivered by DESU and all transactions relating to the contract of sale/work/services, all this in the broadest sense. Agreement: the agreement between DESU and the Buyer/Client/Customer. 2.1. The provisions of these General Terms and Conditions will apply fully to all offers made by DESU and all Agreements between DESU and a Buyer/Client/Customer to which DESU has declared these Terms and Conditions applicable, insofar as the parties have not explicitly deviated from these Terms and Conditions in writing. These General Terms and Conditions will in any case apply to all Agreements with DESU regarding the sale, delivery, payment, placement/installation and repair of the goods sold or to be sold by DESU, and all related Work and services. 2.2. The current Terms and Conditions will also apply to all Agreements with DESU for the performance of which DESU engages any third parties or is required to engage third parties. 2.3. These General Terms and Conditions will be declared applicable to all offers issued, and will apply to both the offer and its acceptance, as well as to the Agreement/Agreements that is/are concluded as a result. 2.4. The provisions of these General Terms and Conditions may be deviated from only if and insofar as this has been expressly agreed in writing. 2.5. The applicability of any general terms and conditions of the Buyer/Client/Customer is hereby expressly rejected. 2.6. In derogation from the above, if the acceptance notice contains any reservations and/or amendments in respect of the offer, the Agreement will only be concluded if DESU notifies the Buyer/Client/Customer that it agrees to those deviations from the offer. 2.7. Any derogations from these General Terms and Conditions will apply only to those provisions for which they have been accepted. The other provisions of these General Terms and Conditions of Sale will expressly remain fully applicable. 3.1. Any offers issued by or on behalf of DESU will not be binding on DESU in any way, unless the offer expressly and unambiguously states the contrary, in writing. 3.2. Any quotations issued by DESU will be without obligation; they will be valid for thirty days, unless the contrary is indicated. DESU will be bound by quotations only if their acceptance has been confirmed by the Buyer/Client/Customer in writing within thirty days. 3.3. The Agreement between DESU and the Buyer/Client/Customer will be concluded as soon as DESU has received a written notice of acceptance of the offer or, in the event of a verbal Agreement, once the supply of the goods and/or the performance of the Work/services has been commenced by DESU and a written notice has been issued to the Buyer/Client/Customer simultaneously. 3.4. Delivery dates stated in quotations issued by DESU are indicative only and will not entitle the Buyer/Client/Customer to dissolution or damages if same are exceeded, unless provisions to the contrary have been explicitly agreed. 3.5. The prices stated in the said offers and quotations will be exclusive of Dutch VAT and other government levies, as well as exclusive of dispatch and possible transport and packaging costs, unless expressly stated otherwise. 3.6. If the notice of acceptance deviates – even on minor points – from the offer contained in the quotation, DESU will not be bound to same. In that event, the Agreement will not be concluded in accordance with that deviating acceptance, unless DESU indicates the contrary. 3.7. A composite quotation will not oblige DESU to supply part of the goods included in the offer or quotation for a corresponding part of the stated price. 3.8. Offers or quotations will not apply automatically to follow-up orders. 3.9. In the event of the cancellation of a quotation signed by or on behalf of the Buyer/Client/Customer, DESU will charge it 25% of the net price quoted, exclusive of Dutch VAT. 4.1. DESU will perform the Agreement to the best of its knowledge and ability and in accordance with the requirements of good workmanship. Such performance will be effected on the basis of state-ofthe-art technology at that time. 4.2. If and insofar as required for the satisfactory performance of the Agreement, at DESU’s exclusive discretion, DESU will be entitled to have third parties perform certain Work. 4.3. The Buyer/Client/Customer shall ensure that all data and documents which DESU indicates are necessary or which the Buyer/Client/Customer should reasonably understand are necessary for the Agreement’s performance are made available to DESU on time. If DESU is not provided with the data and documents necessary for the performance of the Agreement on time, DESU will be entitled to suspend the Agreement’s performance and/or charge the Buyer/Client/Customer the additional costs arising from the delay in accordance with its usual rates. 4.4. DESU will not be liable for damage, of any nature, resulting from the fact that DESU has worked on the basis of incorrect and/or incomplete data provided by the Buyer/Client/Customer, unless DESU should have been aware of this incorrectness or incompleteness. 4.5. If it has been agreed that the Agreement will be performed in phases, DESU may postpone its performance of parts belonging to a subsequent phase until the Buyer/Client/Customer has approved the results of the previous phase in writing. 4.6. If DESU or any third parties engaged by DESU in the context of the assignment perform any Work on site at the Buyer/Client/Customer or at a location of the Buyer’s/Client’s choice, the Buyer/Client/Customer will provide any facilities which the relevant employees reasonably require. 4.7. The Buyer/Client/Customer will indemnify DESU against any claims instituted by third parties, including employees of DESU, who have incurred damage in connection with the performance of one or more Agreements as the result of any act and/or omission on the part of the Buyer/Client/Customer or of unsafe situations on/in/at its immovable property. 4.8. If the assignment is granted by more than one natural person or legal entity, each person/entity will be jointly and severally liable for any obligations ensuing for them from the Agreement. 5.1. Unless the contrary has been agreed in writing, delivery will be effect ex DESU’s warehouse. Deliveries will be effected carriage paid only if and insofar as this has been expressly stated in writing by the Seller/Client on the invoice or a similar document. 5.2. If delivery is effected on the basis of the ‘Incoterms’, the Incoterms that apply at the time of the Agreement’s conclusion will govern the Agreement. 5.3. The Buyer/Client/Customer will be obliged to take delivery of the goods at the time that DESU delivers or has others deliver same to it, or at the time at which the goods are made available to it in accordance with the Agreement. 5.4. If the Buyer/Client/Customer refuses to take delivery of the goods or fails to provide information or instructions necessary for the delivery, DESU will be entitled to store the goods at the Buyer’s/Client’s expense and risk. After a period of four weeks following the expiry of the agreed delivery term, DESU will be entitled to dissolve the Agreement by means of an extra-judicial declaration and DESU will be free to sell the goods in question. The corresponding costs and any lower proceeds will be for the Buyer’s/Client’s account. The storage costs amount to 8% per month, calculated on the total invoice value. 5.5. If the goods are delivered, DESU will be entitled to charge any delivery costs. In that event, such costs will be invoiced separately. 5.6. If the Buyer/Client/Customer takes delivery of the goods from a carrier engaged by and/or operating on the instructions of DESU, this fact will be considered proof that the packaging material is in good condition, unless the Buyer/Client/Customer writes the contrary on the consignment note or the receipt. 5.7. If DESU requires data from the Buyer/Client/Customer in the context of the Agreement’s performance, the delivery term will commence after the Buyer/Client/Customer has made those data available to DESU. 5.8. If DESU has stated a delivery term, that term will be indicative only. A stated delivery date may therefore never be considered a firm deadline. If a term is exceeded, the Buyer/Client/Customer should give DESU written notice of default, by registered letter. 5.9. DESU will be entitled to deliver the goods in parts, unless provisions to the contrary have been laid down in the Agreement or such partial deliveries would not have any independent value. DESU will be entitled to invoice such deliveries separately. 6.1. If the Buyer/Client/Customer has been shown or provided with a sample or model, same should be presumed to have been provided as an indication only, without the good having to correspond to same, unless it has been expressly agreed that the good will be identical. 6.2. In the event of Agreements relating to immovable property, any stated surface areas or other measurements and specifications will also be presumed to be indicative only, without the property having to be fully in accordance with same. 6.3. Any illustrations, drawings, data pertaining to weights, measurements, colors, and data pertaining to the intended use of the equipment contained in price lists, on DESU’s website, and in folders, brochures and advertisements will be compiled with the greatest possible care, but will be approximate only and will not form any grounds for damages and/or dissolution. 7.1. The Buyer/Client/Customer will be obliged to inspect the delivered goods, or have others do so, at the time of delivery/transfer, though in any event within three working days of delivery/transfer. In doing so, the Client/Buyer should investigate whether the quality and quantity of the delivered goods correspond with the Agreements made, or in any case meet the requirements expected in that respect in standard business practice. 7.2. The provisions of Article 5.6 will apply fully. 7.3. Any visible defects or shortfalls should be reported to DESU in writing within three working days of delivery. Invisible defects or shortfalls should be reported in writing within three weeks of their discovery, though no later than within twelve months after delivery. 7.4. Any complaints should be lodged by the Buyer/Client/Customer with DESU in writing, by registered letter, stating the order data and the invoice and consignment note numbers. 7.5. Even if a timely complaint has been lodged in accordance with the preceding paragraph, the Buyer/Client/Customer will remain obliged to take delivery of and pay for the purchased goods. If the Buyer/Client/Customer wishes to return defective goods, it may do so only after obtaining DESU’s written permission, in the manner indicated by DESU. 7.6. In the event of a well-founded and properly lodged complaint, DESU will be obliged, at its discretion, taking account of the interests of the Buyer/Client/Customer and the nature of the complaint: a. to supply any shortfalls; or b. to grant a discount; or c. to repair the goods delivered; or d. to replace the goods delivered; or e. to pay back the purchase price in return for the goods delivered. 7.7. DESU will make the choice referred to in the previous paragraph within a reasonable period of time following the complaint by the Buyer/Client/Customer and will subsequently perform its obligations within a reasonable period of time, in default of which the Buyer/Client/Customer will be authorized to choose from among DESU’s obligations listed above. 8.1. If DESU and the Buyer/Client/Customer have agreed on a fixed sales price, DESU will nevertheless be entitled to increase that price. 8.2. DESU may pass on price rises inter alia if, between the time of the offer and the delivery, significant price changes have occurred in respect of, for instance, exchange rates, wages, raw materials, semi-manufactured goods or packaging materials. 8.3. If the increase is imposed within three months of the Agreement’s conclusion, the Buyer/Client/Customer will be entitled to dissolve the Agreement, unless DESU is prepared to implement the Agreement subject to the original terms and conditions as yet. 8.4. The prices applied by DESU will be exclusive of Dutch VAT and any other taxes, levies and charges, as well as any costs to be incurred in the context of the Agreement, including shipment and handling charges, unless stated otherwise. 9.1. If, during the performance of the Agreement, it proves necessary to amend or supplement the Work to be carried out to ensure proper performance, the parties will adjust the Agreement accordingly, in mutual consultation and in good time. 9.2. If the parties agree that the Agreement will be amended and/or supplemented, this can and may affect the time at which the Agreement’s performance is completed. DESU will inform the Buyer/Client/Customer thereof as soon as possible. 9.3. If an amendment and/or the supplement to the Agreement has financial and/or qualitative consequences, DESU will inform the Buyer/Client/Customer thereof in advance. 9.4. If a fixed rate has been agreed, DESU will indicate in advance to what extent the amendment or supplement to the Agreement will result in the fixed rate being exceeded. 9.5. In derogation from the provisions above, DESU will not charge any additional costs if the amendment or supplement has resulted from circumstances that may be attributed to it. 9.6. Under no circumstance will any amendments/adjustments/supplements to the Agreement, whatever their cause, entitle the Buyer/Client/Customer to damages. 10.1. The Buyer/Client/Customer should effect payment, without applying any deduction, discount or setoff, within the agreed term, though in any case no later than 30 days after the invoice date. Payment should be made in the manner to be indicated by DESU in the currency stated in the invoice. 10.2. If the Buyer/Client/Customer fails to pay within the 30-day period, the Buyer/Client/Customer will be in default by operation of law. The Buyer/Client/Customer will then owe interest at a 1% rate per month, unless the statutory interest is higher, in which case the statutory interest will apply. The interest on the exigible amount will be calculated from the time at which the Buyer/Client/Customer is in default to the time of full payment. 10.3. If the Buyer/Client/Customer is liquidated or declared bankrupt, if attachment is levied on it or it is granted a suspension of payments, DESU’s claims vis-à-vis the Buyer/Client/Customer will fall immediately due and payable. 10.4. If the Buyer’s/Client’s financial position or payment behavior give cause for doing so, DESU will be entitled to require that the Buyer/Client/Customer provide security or supplementary security forthwith, in a form to be determined by DESU. If the Buyer/Client/Customer fails to provide the required security, DESU will be entitled, without prejudice to its other rights, to immediately suspend its further performance of the Agreement and all amounts owing by the Buyer/Client/Customer to DESU, on whatever basis, will become immediately due and payable. 10.5. DESU will be entitled to first use payments made by the Buyer/Client/Customer to cover the costs, then to cover any interest due and finally to cover the principal sum and the accrued interest. DESU may refuse an offer of payment if the Buyer/Client/Customer specifies a different order for the payment allocation, without being in default as a result. DESU may refuse to grant complete discharge in respect of the principal sum if the payment does not also include the settlement of any interest due, the accrued interest and the costs. 10.6. DESU will be entitled to charge the Buyer/Client/Customer a 2% surcharge on late payments. This surcharge will not be payable if payment is made within seven days of the invoice date. 11.1. All goods supplied and still to be supplied, including any designs, sketches, drawings, films, software, (electronic) files etc., will remain the property of DESU until all claims DESU has or will have on the Buyer / Client / Customer, in any case including the amounts due as stipulated in article 3:92 paragraph 2 of the Dutch Civil Code, as well as all obligations under all Agreements concluded with DESU, have been paid or have been performed completely. Acceptance of bills of exchange or other bills and cheques payable to order or bearer papers are not valid as a payment / fulfilment. 11.2. The Buyer / Client / Customer is not entitled to sell or pledge goods subject to retention of title or encumber them in any other way. 11.3. If a third party seizes goods supplied subject to retention of title, or wishes to establish or enforce rights on it, the Buyer / Client / Customer will be obliged to inform DESU immediately of this in writing by means of a registered letter. 11.4. The Buyer / Client / Customer is obliged to store the goods, supplied subject to retention of title, with care and to store these goods separately so that they are always identifiable as the goods supplied by DESU. 11.5. The Buyer / Client / Customer is obliged to insure the goods supplied subject to retention of title and keep them insured against fire, explosions and water damage, as well as against theft, and to submit this insurance policy for inspection at DESU’s first request. 11.6. The goods supplied by DESU subject to retention of title may only be sold by the Buyer / Client / Customer in the normal pursuance of the client’s business or profession and may never be used as a means of payment and furthermore may not be given as security by the Buyer / Client / Customer, neither may they serve as security for one or more claims by a third party. The Buyer / Client / Customer will transfer in advance, and DESU accepts this transfer in advance, without a further deed being required, all its claims on third parties pertaining to goods sold on to third parties, which have not been paid to DESU. The Client will provide the names and addresses of these third parties at DESU’s first request. DESU is authorised to serve this assignment to third parties in their capacity as debtor and besides to settle the funds received from the assignee with its claim, such under responsibility to transfer to possible surplus, upon deduction of all costs to the Buyer / Client / Customer. 11.7. In the event DESU wishes to exercise the proprietary rights stipulated in this article, the Buyer / Client / Customer hereby grants its unconditional and irrevocable permission to DESU or to any third party appointed by DESU, to enter all the places where DESU’s property is located and to recover those goods. 11.8. DESU is entitled to recover the goods supplied subject to retention of title and which are still in the Buyer’s / Client’s / Customer’s possession if the Buyer / Client / Customer is default in paying or has payment difficulties or is likely to get into financial difficulties. The Buyer / Client / Customer will, at all times, grant DESU access to its premises and/or buildings to inspect the goods and/or to exercise DESU’s rights. 12.1. DESU warrants that the goods to be supplied will meet the usual requirements and standards which may be imposed in respect of same and are without defects. 12.2. The warranty referred to in paragraph 1 will also apply if the goods to be supplied are intended to be used abroad and the Buyer/Client/Customer has expressly notified DESU of this intended use in writing at the time of the Agreement’s conclusion. 12.3. If the goods to be delivered do not meet the provisions of this warranty, DESU shall – at DESU’s discretion – replace the good or have it repaired, within a reasonable period of time following its receipt of the goods or, if it is not reasonably possible to return the goods, following the written notification of the defect in question from the Buyer/Client/Customer. If the goods are to be replaced, the Buyer/Client/Customer undertakes in advance to return the replaced good to DESU and grant DESU title thereto. 12.4. The warranty referred to above will not apply if the defect has arisen as the result of inexpert or improper use, or if the Buyer/Client/Customer or third parties have made or have attempted to make alterations to the good without DESU’s written permission, or have used the good for purposes for which it was not intended. 12.5. If the warranty issued by DESU relates to a good produced by a third party, the warranty will be limited to the warranty issued by the manufacturer in respect of the good. 13.1. If the Buyer / Client / Customer is in default or fails to meet one or more of its obligations, all reasonable extrajudicial costs incurred to obtain an out-of-court settlement will be borne by the Buyer / Client / Customer. If the Buyer / Client / Customer remains in default with regard to a payment, it will incur an immediately due and payable penalty amounting to 10% of the amount due. This with a minimum of € 500.00. 13.2. If DESU incurred higher costs, which were required in all fairness, such costs will also qualify for compensation. 13.3. Any reasonable judicial and extrajudicial costs incurred will also be borne by the Buyer / Client / Customer. 13.4. The Buyer / Client / Customer will owe interest over the collection costs incurred. – upon the Agreement’s conclusion, the Buyer/Client/Customer was requested to provide security for the performance of its obligations under that Agreement and such security was not provided or is insufficient. As soon as security has been provided, the right to suspend performance will lapse, unless the performance has been unreasonably delayed as a result. 14.2. In addition, DESU may dissolve the Agreement or have it dissolved if circumstances arise of such a nature that performance of the Agreement is impossible or can no longer be required pursuant to standards of fairness and reasonableness, or if any other circumstances arise of such a nature that continued unamended maintenance of the Agreement can no longer reasonably be expected. 14.3. If the Agreement is dissolved, DESU’s claims vis-à-vis the Client will become immediately due and payable. If DESU suspends its performance of its obligations, it will retain its rights pursuant to the law and the Agreement.14.4. DESU will at all times retain the right to claim damages. 15.1. If DESU has made goods available to the Buyer/Client/Customer in the context of the Agreement’s performance, the Buyer/Client/Customer will be obliged to return those goods within 14 days, in their original condition, free of defects and complete. If the Buyer/Client/Customer fails to fulfil this obligation, all resulting costs will be for the Buyer’s/Client’s account. 15.2. If the Buyer/Client/Customer remains in default, for whatever reason, following a warning issued for that purpose in respect of the obligation referred to in paragraph 1, DESU will be entitled to recover any resulting damage and costs, including the costs of replacement, from the Buyer/Client/Customer. 16.1. DESU’s (total) liability is limited to the performance of DESU’s obligations as stipulated in these General Terms and Conditions. Any other liability, with the exception of DESU’s guarantee obligations as stipulated in these General Terms and Conditions, is excluded. 16.2. DESU’s liability for indirect damage, including consequential damage, loss of income, lost savings and damages caused by the interruption of business operations, is excluded. 16.3. DESU’s liability is limited to the amount which is paid out under its professional liability policy for the matter concerned, plus the amount of the excess that is not borne by the insurer according to the insurance policy terms and conditions. insurance policy, or if the insurer, for whatever reason, does not make a payment, the compensation for any loss, due to whatever reason, shall never exceed the invoice value of the goods supplied, in respect of which damages have occurred, or, as the case may be, the invoice value for the advice and/or explanations provided by DESU, or in the absence of an invoice, to a maximum amount of € 1,000,– (in words: one thousand Euros). The compensation for a loss will never exceed € 15,000.– (in words: fifteen thousand Euros). 16.5. The maximum amount stipulated in the previous paragraph will be cancelled if and inasmuch the loss is the result of an intentional act or is the result of gross negligence on the part of DESU. 16.6. A condition for any rights to compensation is that the Buyer / Client / Customer must always report the damage to DESU’s management in writing by means of a registered letter immediately after the occurrence of the damage. 16.7. Losses arising from activities DESU subcontracted to one or more third parties will only be compensated if and inasmuch the loss is compensated or will be compensated by the relevant third party or parties and DESU has actually received the compensation, after deduction of the relevant expenses incurred by DESU. 16.8. DESU is not liable for losses caused by any employees and/or freelancers it has seconded to the Buyer / Client / Customer, with the exception of intentional losses or losses as a result of gross negligence on the part of the employees and/or freelancers seconded to the Buyer / Client / Customer. 16.9. The limitation of liability stipulated in this provision also applies to appointed third parties which can therefore invoke a direct limitation of liability. 16.10. DESU is not liable for costs, losses and interest which may result directly or indirectly from – violation of patents, licences or other third party rights as a result of the use of any data provided by or on behalf of the Buyer / Client / Customer; – acts or negligence by the Buyer / Client / Customer, its employees, or other persons who were employed by or on behalf of DESU; – failure to meet the delivery date. 16.11. The Buyer / Client / Customer guarantees it is authorised to place the relevant order, and that it has paid any fees due to third parties in relation to this order. The Buyer / Client / Customer is liable for the accuracy of the information provided to DESU and indemnifies DESU for any breaches of patents, licenses, trademark rights, design rights, copyrights and all other industrial property rights or other third party rights. DESU has the right to take all required measures pertaining hereto at the expense of the Buyer / Client / Customer. 17.1. The risk relating to the loss of or damage to the products that are the subject of the Agreement will pass to the Buyer/Client/Customer at the time that those products are legally and/or actually delivered to the Buyer/Client/Customer and therefore come under the Buyer’s/Client’s control or under the control of third parties designated by the Buyer/Client/Customer. 18.1. The phrase ‘force majeure on DESU’s part’ will be understood to include any circumstances outside its control, for which it is not to blame and which is not for its account pursuant to the law, a juristic act or standard commercial practice, which fully or partially prevent the performance of its obligations vis-à-vis the Buyer/Client/Customer or as a result of which it cannot be reasonably expected to perform its obligations, irrespective of whether such circumstance could have been foreseen at the time of the agreements’ conclusion. Such circumstances will also include strikes, illness of staff and unforeseeable delays. The term ‘force majeure’ will also include any situation of force majeure on the part of DESU’s suppliers. 18.2. If DESU is unable to perform its obligations due to force majeure, these obligations will be suspended for the time that the situation of force majeure lasts. 18.3. If the situation of force majeure has lasted two (2) months, either party will be entitled to fully or partially dissolve the agreement by means of a written, substantiated statement sent by registered post, without any right to damages or compensation arising. 18.4. The parties will notify each other of a possible or actual situation of force majeure in writing, by registered letter, as soon as possible. 18.5. DESU will expressly be entitled to invoke force majeure if the circumstance preventing performance or further performance arises after DESU should have performed its obligations. 19.1. The Buyer/Client/Customer will indemnify DESU against any claims of third parties relating to intellectual property rights to materials or data made available by the Buyer/Client/Customer which are used during the performance of the Agreement. 19.2. If the Buyer/Client/Customer provides DESU with data carriers, electronic files, software, etc., it must guarantee that such data carriers, electronic files, software, etc., are virus-free and without defects. 20.1. Without prejudice to the other provisions of these General Terms and Conditions, DESU reserves the rights and powers vested in it pursuant to the Dutch Copyright Act [Auteurswet]. 20.2. The Buyer/Client/Customer will not be permitted to modify goods, unless the contrary follows from the nature of the goods supplied or has been agreed in writing. 20.3. Any designs, sketches, drawings, films, software and other materials or electronic or other files created by DESU in the context of the Agreement will remain DESU’s property, irrespective of whether same have been made available to the Buyer/Client/Customer or to third parties, unless the contrary has been agreed. 20.4. All documents and goods made available by DESU, such as designs, sketches, drawings, films, software, electronic or other files, etc., are intended for use by the Buyer/Client/Customer only, and may not be reproduced, made public or disclosed to third parties by the Buyer/Client/Customer without DESU’s prior permission, unless the contrary ensues from the nature of the documents and goods. 20.5. DESU will retain the right to use any knowledge acquired during the performance of the Work for other purposes, insofar as this does not involve making confidential information available to third parties. 21.1. Both parties will be obliged to observe secrecy with respect to all confidential information which they may have obtained from one another or from another source in the context of the Agreement. Information will be considered confidential if it has been designated as such by the relevant party or if its confidential nature ensues from the nature of the information. 21.2. If DESU is obliged pursuant to a statutory provision or a judicial decision to provide third parties designated by law or by the competent court with confidential information and DESU is unable to invoke a right to decline to give information acknowledged or allowed by law or by the competent court, DESU will not be obliged to compensate the other party or pay it damages and the other party will not be entitled to dissolve the Agreement on the basis of any damage that may have arisen as a consequence. 21.3. The Buyer/Client/Customer will not be permitted to use any information made available by on or behalf of DESU for any other purpose than that for which it was provided. 22.1. During the Agreement’s term and for one year following its termination, the Buyer/Client/Customer will refrain – except following proper professional negotiations in this respect with DESU – from acquiring or employing in any other way – directly or indirectly – employees of DESU or enterprises engaged by DESU for purposes of this Agreement, who are or were involved in the performance of the Agreement. 22.2. The prohibition laid down in paragraph 1 will be subject to the forfeiture of an immediately due and payable penalty of EUR 5,000 per event and EUR 500 for each day that the Buyer/Client/Customer’s violation continues, payable to DESU, without prejudice to DESU’s right to claim full damages insofar as such a claim might exceed the said penalty. Article 23 Agreement for placement/installation 23.1. The conclusion of an Agreement will be subject to the condition that the goods to be placed/installed were sold and supplied by DESU to the Buyer/Client/Customer. 23.2. The wishes of the Buyer/Client/Customer will be taken into account during the placement/installation of goods sold and supplied by DESU and the manner in which such activities are carried out, insofar as this is possible and sound in the opinion of the contractor/mechanic engaged by DESU. 23.3. The prices fixed in the quotation will be based on the Work normally involved in such placement/installation. Work normally involved in placement/installation will not include demolition work, carpentry, painting, opening up and closing ceilings and installing and moving telephone and electricity connections. 23.4. If, in the contractor’s/mechanic’s opinion, the situation cannot be considered standard, DESU will so inform the Buyer/Client/Customer in writing and issue a supplementary quotation for the additional price relating to the additional work to be performed. 23.5. After the placement/installation has been completed, the Buyer/Client/Customer will consign a document evidencing the proper completion of the Work and submit same to DESU. Article 24 Agreement on the performance of placement/installation work 24.1. Appointments made may be postponed or cancelled until 48 hours before the relevant appointment. If agreements are postponed or cancelled at a later point in time, the Buyer/Client/Customer will be charged costs. 24.2. The Buyer/Client/Customer shall enable the persons designated by DESU to perform the necessary Work, in accordance with the agreements made. If so requested, these persons will identify themselves. 24.3. If the Buyer/Client/Customer fails to perform any agreements, without issuing a timely notice in advance, the Buyer/Client/Customer will be charged the costs of the unnecessary visit. 25.1. If any provision of these General Terms and Conditions is null and void or annullable, this will not affect the validity of the other provisions. 26.1. If and insofar as any provision in these General Terms and Conditions cannot be invoked pursuant to standards of fairness and reasonableness or in view of its unreasonably objectionable nature, the relevant provision will be considered to have such a meaning as regards its substance and purport that it can be invoked. 27.1. This Agreement covers all agreements made by the parties in connection with the Agreement’s subject. As per the Agreement’s effective date, any earlier agreements made between the parties will lapse. 27.2. The parties undertake to notify one another in good time of any changes of address by registered letter. 27.3. These General Terms and Conditions may be amended by DESU at all times. Such changes will apply to existing agreements effective from 14 days after they have been communicated. Such a communication may also consist of a notice with or on an invoice sent to the Buyer/Client/Customer. 28.1. Any disputes that may arise between the parties further to one or more Agreements existing between them or further to any subsequent agreements, that may ensue from same or from any existing or future legal relationship, will be settled by the competent court in Rotterdam, the Netherlands, except insofar as this choice of forum is prevented by mandatory rules on judicial competence. 29.1. Any agreements between DESU and the Buyer/Client/Customer will be governed by Dutch law, subject to the exclusion of the United Nations Convention on Contracts for the International Sale of Goods (CISG). 30.1. These Terms and Conditions have been filed at the offices of the Rotterdam Chamber of Commerce. 30.2. In the event of a difference in interpretation regarding the substance and purport of these General Terms and Conditions between a translation and the Dutch text, the Dutch text will prevail. 30.3. The version that was most recently filed and/or the version that applied at the time of the Agreement’s conclusion will apply.